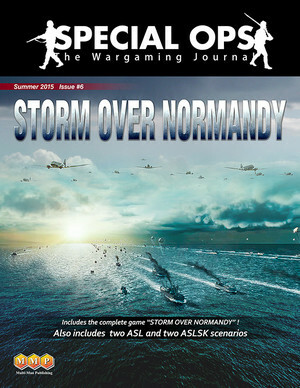 Storm Over Normandy uses the Area Move system introduced in MMP's hit games Storm Over Stalingrad and Storm Over Dien Bien Phu. The game focuses on the landings on the five beaches “Sword”, “Juno”, “Gold”, “Omaha”, “Utah”, plus the Allied paratrooper operations, and the German response over the first week of the battle. The entire game can be played in less than 3 hours. The game features the use of cards to augment game play, allowing specific chrome to be added to the game without additional rules overhead. The rules are similar in length and complexity to those seen in Storm Over Stalingrad, and contain many examples of play, with modifications to the system made to represent the scale and nature of the operation.